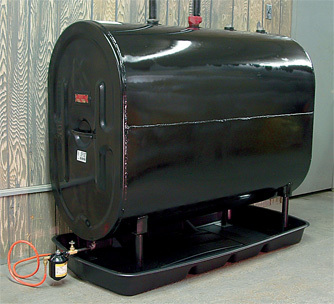 In most cases, you will find that you have an oil storage tank that will hold 275 gallons of oil. A traditional fill of the tank will usually include 245 gallons, this accounts for air and debris on the bottom of the tank. When a Glow driver fills your tank they will hear a whistle sound, once the whistle stops the driver must turn off the pump. This indicates that the tank is full and pumping should be stopped immediately. 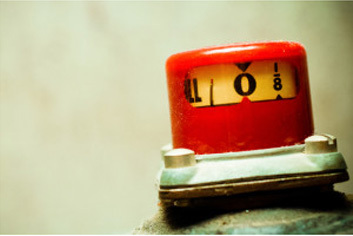 How do you know when you should order your next oil delivery? How much fuel is actually in my tank when the gauge says 1/8? These are a few of the questions that we receive and we'll try to answer these and more below. 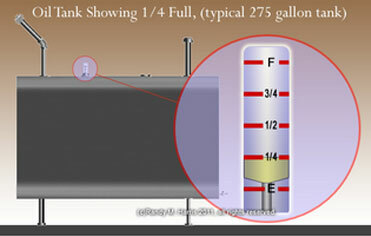 There are 2 types of gauges found on most home heating oil tanks. Most common is a gauge similar to the one above to the left, however they can also look like the gauge to the right. The gauge represents how much fuel is left in the tank, a general rule of thumb is to never let the gauge get below 1/4. If you run out of home heating oil in your tank before more fuel is delivered your boiler or furnace will need to primed, this is an additional service that carries a fee. The best practice to avoid this fee is to order fuel when the gauge gets to 1/4. While we offer next day delivery, depending on your fuel usage and the accuracy of your gauge you could run out of fuel on extremely cold winter nights with 1/8th of a tank. 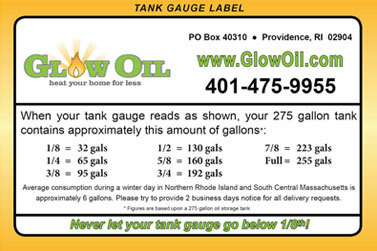 How many gallons of home heating oil are in my tank and how long will it last? Here is a handy chart that will help you keep track of how much fuel is in your tank based on the reading of the gauge. How long will that quantity of oil last? That depends on the efficiency of your boiler or furnace, size of your home, water heater use, and the temperature of your home. This is why we suggest enrolling in Automatic Deliveries, where you can enjoy the discounted price of a COD business without having to worry about checking your tank. We'll figure out your fuel usage and keep you warm and comfortable this winter.